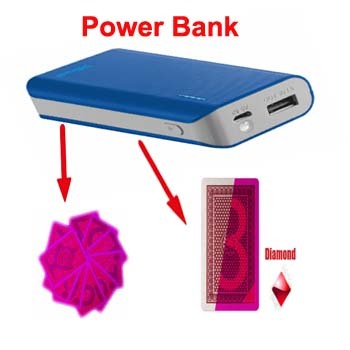 Playing cards games have lots of fun with every time winnings and this needs each time a new trick, good luck and our new product Power Bank Marked Playing Cards Scanner Device. Poker bank cheating cards device is the latest design camera that scan the bar codes marked on the playing cards and also can use it to charge mobile phone. Poker bank marked cards scanner device can’t be seen in infrared light camera and also by UV sunglasses and contact lens.